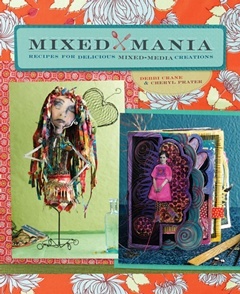 Mixed-Mania is written by Debbi Crane and Chery Prater. As new media changes the way we communicate, it is interesting to know that they collaborated long-distance on this book. But it is even more interesting to know that they had not met in person and were introduced online through mutual art connections. They worked on the book entirely online and only met in person a couple of times, yet they banter as if they have been life-long friends. I marvel at this dynamic and think about how this sort of thing would not have happened as easily fifteen years ago. It starts with some “Creative Kitchen Basics” (A discussion of the elements and principles of art) moves into some “Artistic Appetizers” which are easy projects, then some “Main Courses” and “Special Occasions” that are larger projects including several fabric related pieces. 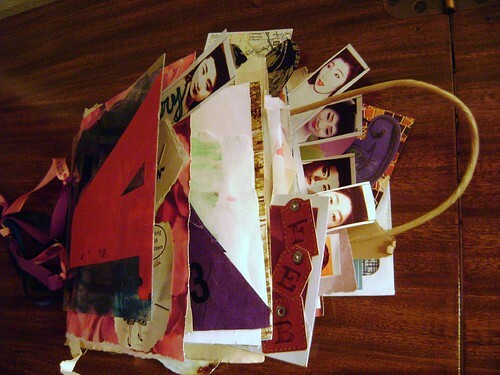 At the end there is a gallery, which I always love and some templates for the included projects. 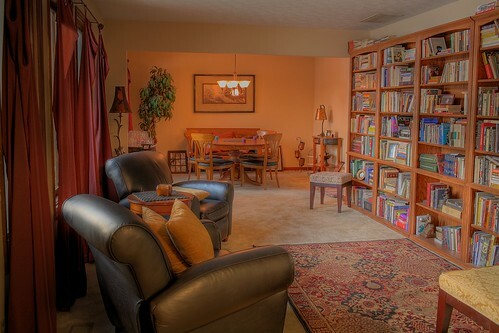 Each project is set up with shopping and ingredient lists, followed by step-by-step instructions and pictures. Most of the bigger projects are broken down into smaller parts and start with some text about the inspiration and back ground of the project. Throughout the book there are snippets of the creative dialogue between the two writers, which is fun. I haven’t done any of the projects, but many of them look a lot like things I have already done. 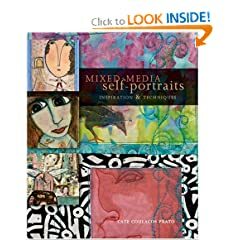 I would certainly recommend this book for people new to mixed media. While the images are inspiring and fun, I didn’t really see any great new skills for me to learn. So this one will be going back to the library. 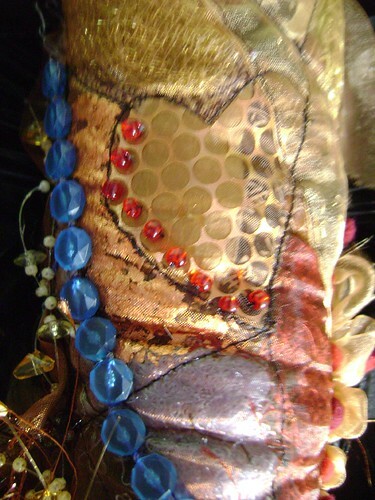 This entry was posted in Book Reviews and tagged art, Book Reviews, books, mixed media on August 17, 2009 by Sheba. I have several great art books on my list. What are some of your favorites? What books are you IN? This one looks good and has artwork from many artists that I know from Artfest and online blogs that I follow. Actually, this is mostly how I find books that I want usually. If someone mentions their book online, or one in which they have work, then I am interested and curious enough to put it on my wishlist. I think I saw this on Kelly Rae’s blog. 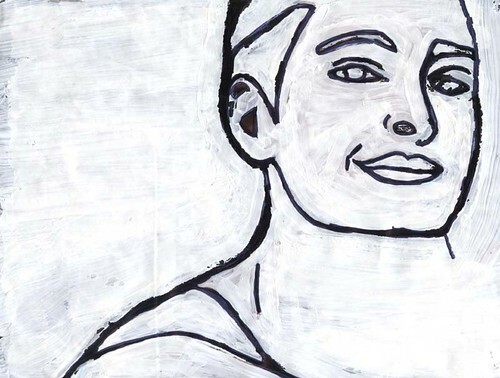 Most of my work is in the realm of self-portrait so I am curious how other people approach the topic. This one I saw in the fabric store and knew it needed to be in my collection… But since it is December, I am banned from buying things for myself. 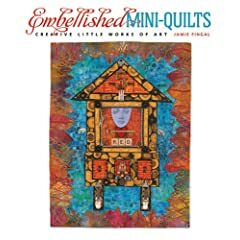 Embellished Mini-Quilts: Creative Little Works of Art by Jamie Fingal. 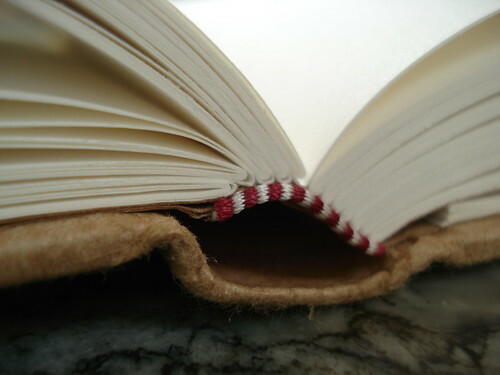 I probably should only have fabric related books on my list anyways, since I am trying to limit myself to fabric work. 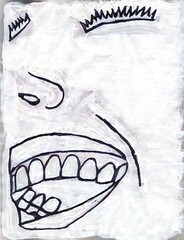 I need to purge all my paper supplies, since I just don’t work in that medium any more. This book has many projects that fit my style and others that don’t but that is typical. 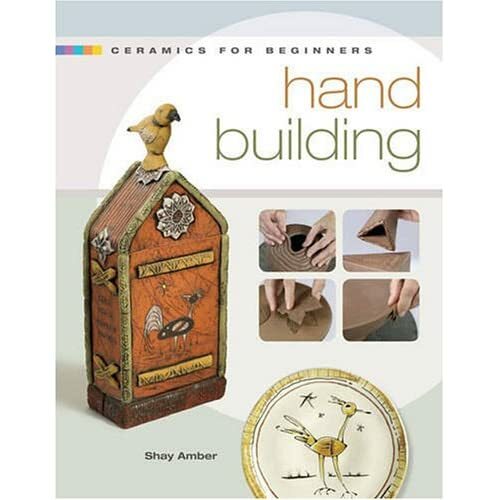 But I would love to stretch myself into some new fabric techniques, this seems like the perfect book to do it with. 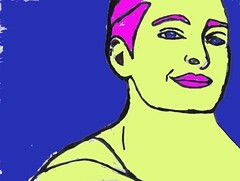 Jamie has a great website and makes journal quilts, abstracts and portraits that are whimsical and wonderful. This entry was posted in Pastimes and tagged books, wishlist on December 14, 2008 by Sheba. I wasn’t really sure I was going to like this weeks Challenge but I have to admit I am pleased with the results. I used a pretty thick layer of gesso so you can’t see anything through, then I scanned them in because I decided to play with some color in photoshop. Overall, it was intersting becasue I don’t think of myself as a painter or having any painting skills… and this made me feel like, maybe I could paint! This entry was posted in Jen's Challenge 2008 and tagged art, books, challenge, magazines, paint on February 6, 2008 by Sheba.